Community websites MySpace and Bebo are fighting to see who is most popular among young people, reveals research. Analysis by Nielsen NetRatings shows the two companies have regularly swapped the top spot in sites that give people space to blog and post pictures. Nielsen said the pair are the fifth and sixth biggest brands on the net when measured by page views. The competition between the two looks set to intensify as Bebo gets a $15m (£8m) funding boost from investors. Although both MySpace and Bebo are relative newcomers to the web, both have proved hugely popular with younger users. Nielsen NetRatings said the growth in the two free-to-use sites had far outstripped the 12% annual growth in audience seen among the so-called "member community" sites. By comparison over the same time period Bebo's audience grew 162% and that of MySpace by 295%. Both sites give people their own webspace that they can use to post journal or blog entries or use as a gallery for pictures or videos. The sites encourage people to get their friends involved and comment on the information being posted. 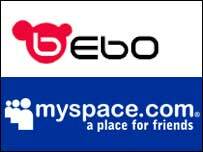 In April 2005, Bebo was recording 790,000 unique users compared to only 443,000 for MySpace. However, News Corporation's purchase of MySpace for $580m (£308m) in July 2005 has helped it catch up and overtake its rival. "The six months after News Corp bought MySpace saw them and Bebo leapfrogging each other as the most popular of the member communities that centre on user-generated content," said Alex Burmaster, european internet analyst at Nielsen NetRatings. The analysis shows that Bebo users tend to be younger than those on its rival with 54% of Beboers aged under 18 compared to 31% on MySpace. The audience on Bebo tends to make more use of the site spending, on average, one hour and 52 minutes on the site every month. MySpace members rack up only one hour 28 minutes a month. Mr Burmaster said it would be interesting to see how the two sites evolve and expects to see other money making methods added to each. Ultimately it might not be the market that determines the success of either site. Some schools are moving to clamp down on the use of both services over fears that children are posting unsuitable material to sites such as Bebo and MySpace. For instance, in late May a school district in Illinois has said it will punish students that post images or information about underage smoking, drinking and other "inappropriate" or illegal activities. The district is now encouraging its 3,200 students to sign up to the new code of conduct.